Therefore we must ascend again towards the Good, the desired of every Soul. Anyone that has seen This, knows what I intend when I say that it is beautiful. Even the desire of it is to be desired as a Good. To attain it is for those that will take the upward path, who will set all their forces towards it, who will divest themselves of all that we have put on in our descent: so, to those that approach the Holy Celebrations of the Mysteries, there are appointed purifications and the laying aside of the garments worn before, and the entry in nakedness—until, passing, on the upward way, all that is other than the Good, each in the solitude of himself shall behold that solitary-dwelling Existence, the Apart, the Unmingled, the Pure, that from Which all things depend, for Which all look and live and act and know, the Source of Life and of Intellection and of Being. WHEN I AM weary of worldly commitments and the capriciousness of the human condition, by the grace of some inner calling I know not whence, I set off once again on my travels in search of beauty and being and the source of life itself. This time, northern Greece is my destination and the rock forest of Meteora (from the Greek words “meta” and “aeiro”, together meaning “suspended in air”) and the home of the celestial gods. Given my love of the written word, this is one time when I am rendered mute in my ability to express how I respond experientially, psychologically and even ontologically to the metamorphic land mass unfolding in front of me as I step out onto my balcony situated at the very foot of the monastery complex. Visit Meteora Travel, Meteora Cave. 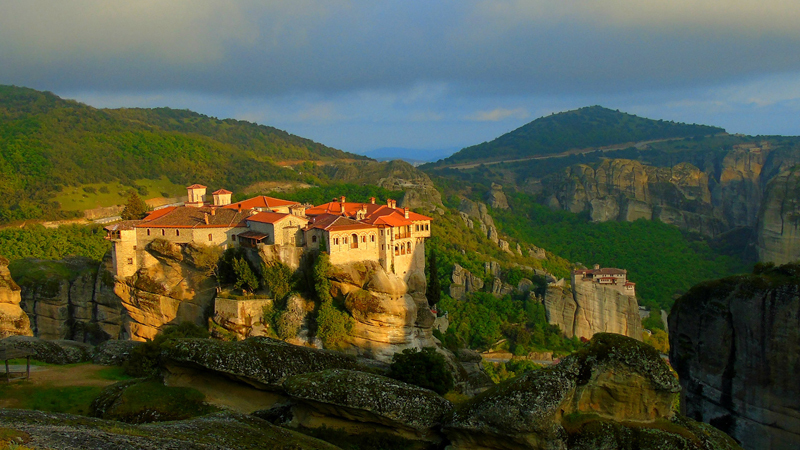 After Mount Athos, Meteora is the largest monastic centre in Greece. Situated at the northwestern edge of the region of Thessaly, it is a network of hundreds of rock formations that rise majestically up towards the skies beyond the provincial village of Kastraki. Owing to tectonic forces and the weathering effects of nature, wind and water, the geomorphological development of the area has resulted in an utterly breathtaking natural phenomenon, so much so that Meteora was included on UNESCO’s World Cultural and Natural Heritage List in 1988. 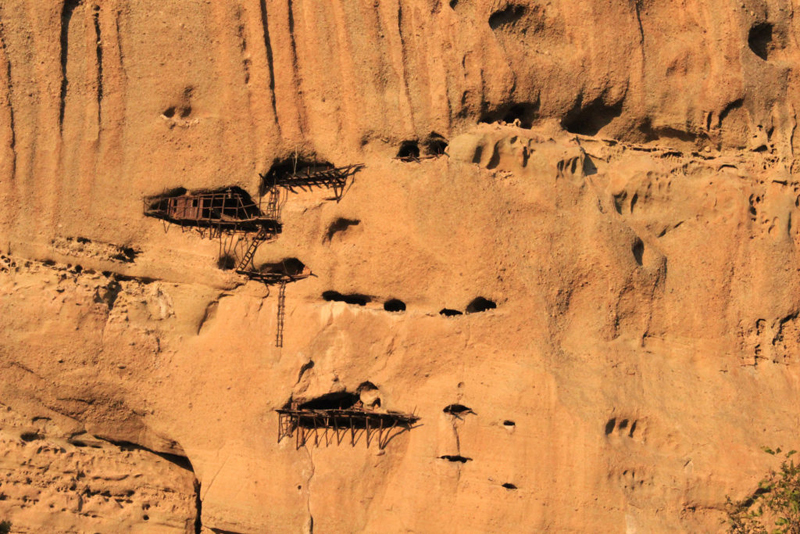 Indeed, the magical landscape was an inevitable choice for the first hermits and monks who settled in Meteora back in the tenth and eleventh centuries seeking tranquillity and refuge amidst the caves and cavities of the rocks. 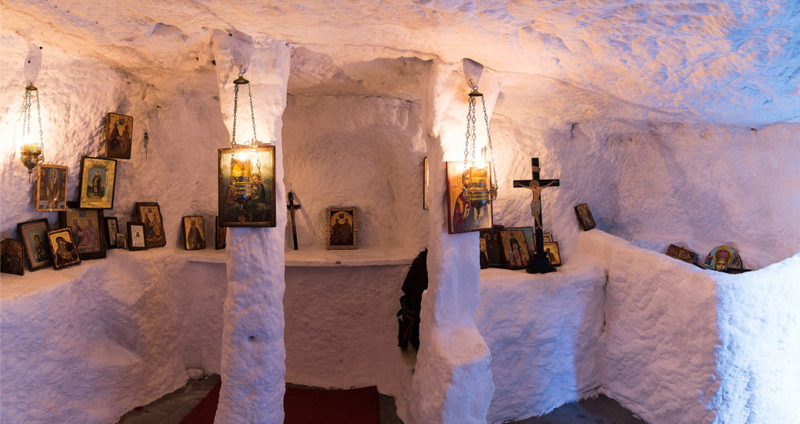 By the twelfth century, a small ascetic community had been established, the Skete of Doupiani, who would come out of their cells and meet together every Sunday to attend the ceremony of the Eucharist. By the fourteenth century, the arrival of Athonite monks escaping Turkish raids on Mount Athos also played an important role in the further development of monasticism in the region, with the founding of the first fully-fledged monastery, Great Meteoron. Monasticism reached its zenith during the fifteenth and sixteenth centuries, whereby over 40 monasteries and hermitages were constructed, attracting scholars, artists and holy men, who compiled and copied manuscripts and codices, as well as painted murals and icons, all contributing to the ascetically and aesthetically infused ambience. By the twentieth century, bridges were built and staircases were carved into the crags in order to facilitate easier access to the monasteries; the nets and rope ladders that had previously been the only means of reaching the summit of the rocks were deemed too dangerous and subsequently fell into disuse. Today, the decline in the calling of the eremitic life has meant that there are only four working monasteries occupied by monks—Great Meteoron, Varlaam, Holy Trinity and Saint Nicholas Anapausas—and only two cloistered houses occupied by nuns—Saint Stephen and Roussanou—who all collectively carry together the creed and cultural inheritance of the Greek Orthodox Church. Nevertheless, the popularity of the Meteora region is higher than ever, with literally millions of visitors making their own personal pilgrimage, be it sublunary or sacred, each and every year. 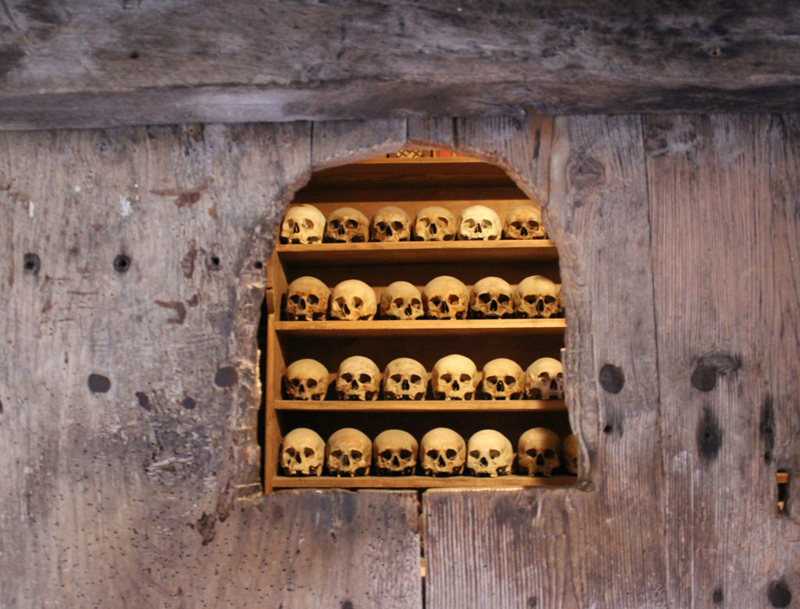 Visit Meteora Travel, Meteora Ossuary. Each monastery exudes its own unique vibration: the imposing majesty of Great Meteoron; the elegant grandiosity of Varlaam; the imperial solidity of Holy Trinity; the charming nobility of Saint Stephens; the embracing modesty of Roussanou; the idiosyncratic humility of St Nicholas Anapausas. Having visited every single one over the course of my sojourn, it is Saint Nicholas Anapausas to which I am irrevocably drawn. Located just outside Kastraki, it is the first monastery I meet on the road winding its way through the monastery network as well as being the smallest, with only one monk currently living within the confines of its walls. The origin of the moniker of the hermitage is unknown but scholars suggest it is either taken from the name of one of its early founders or it is simply derived from the verb, “anapavonomai”, meaning “to rest”. Either way, I commence the climb up the stone steps to the summit, arriving breathless and somewhat exhausted, having to pause awhile in order to acclimatize both my mind and battering heart. Visit Meteora Travel, Meteora Caves. Owing to the limited space atop its craggy outcrop, rather than being extended horizontally like its more imposing architectural counterparts, St Nicholas Anapausas is constructed on different levels, one vertically above the other. What to some may feel claustrophobic, the confinement of the design renders the atmosphere imbued with mystery and otherworldliness, far removed from the woes of the world I have temporarily left behind. After donning a long skirt as per the monastic code for women, I climb a narrow staircase right into the hermitage’s interior to find the katholikon (central church) dedicated to Saint Nicholas. Believed to have been erected in the fourteenth century, the chapel was later refurbished two centuries later and adorned with paintings by the famous Cretan iconographer, Theophanes Strelitzas Bathas (Theophanes the Cretan). Lightheaded from the elevated altitude and wafts of incense seeping deep into my soul, I again stand overwhelmed by the indescribable beauty now unfolding before me. 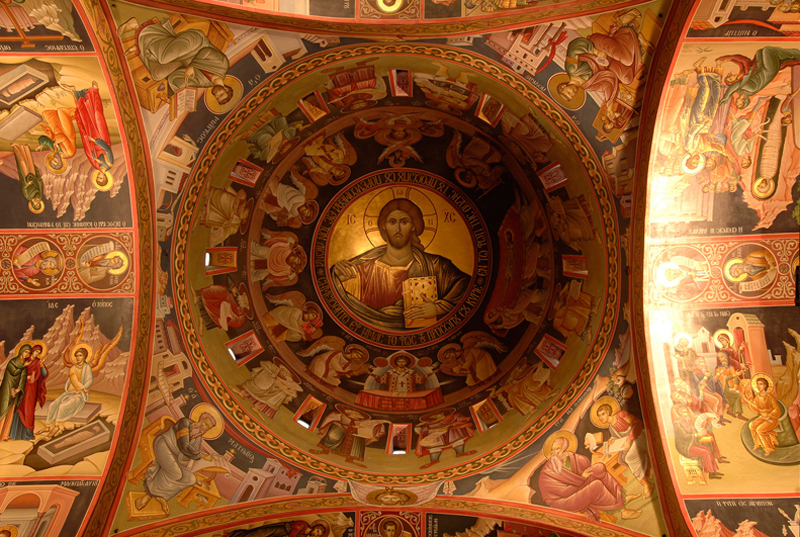 Both nave and narthex are decorated with Theophanes’ murals—the figures of saints and ascetics; Adam giving names to various birds and animals in paradise; the miracles of Jesus—collectively exemplifying some of the most significant works of sixteenth-century, post-Byzantine art. Visit Meteora Travel, Meteora Frescoes. Climbing further up, I pass the traditional vrizoni (hoisting mechanism used to access the monastery) and then, ascending further still, I emerge out onto the roof terrace, where there are wooden balconies, seating and a stone bell tower touching the clouds above. 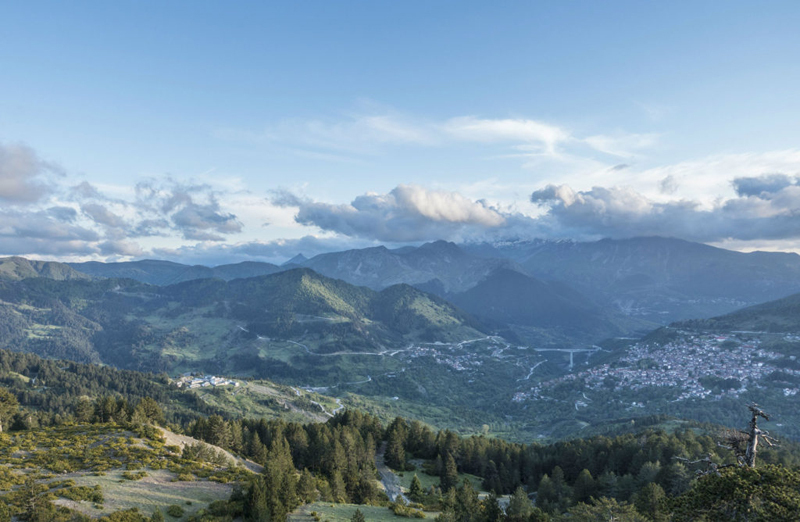 The panoramic views are utterly spellbinding. 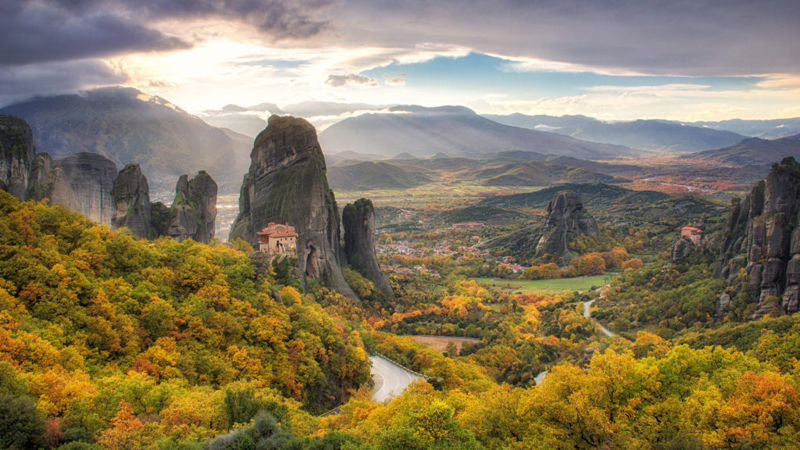 The vast Thessaly plain stretches out into the distance, the vertical cliffs of Meteora reaching up like stalagmites in an attempt to unite heaven and earth. Despite being late autumn, the sun’s rays bathe me in an aureate light as I start to imagine the centuries of renunciates who have stood here before me, similarly moved by the urge to find spiritual connection with the divine. I have booked a walking tour and the following day, rendezvous with a small group of hikers and a local guide at the foot of Doupiani rock just outside my guesthouse. Having had a protracted spate of influenza, I am well below par in terms of my physical fitness and while we stroll past ruins and hidden monasteries and then follow an old footpath deep into the heart of an ancient oakwood forest, I soon fall far behind. As the chattering voices fade under the susurration of the leaves above me, I am consumed with a feeling of the deepest peace. I stop still and imbibe the verdant sounds and scents as if lost in an ephemeral dream. 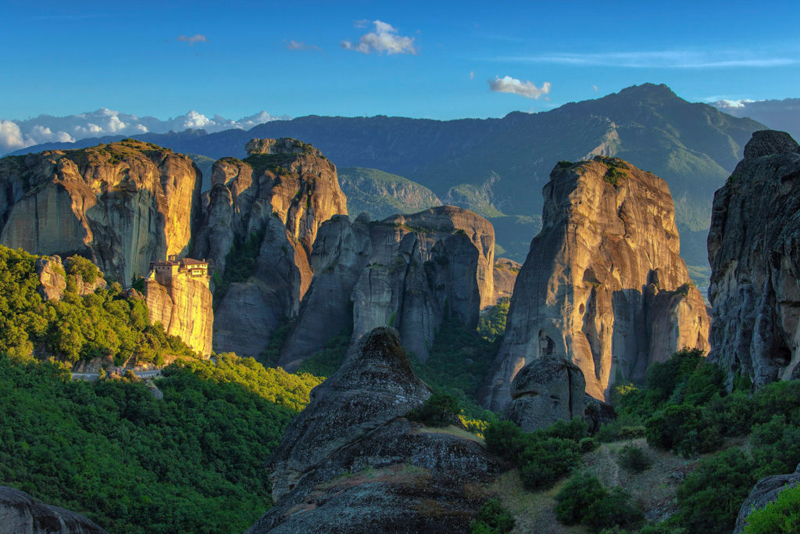 Visit Meteora Travel, Metsovo Mountains. Wherever I travel, I always take a small kettle, teapot and loose green tea so that I may partake of my favourite refreshment. As the sencha leaves steep silently on the small table before me back on the balcony of my guesthouse, I savour the moment by drinking in the beauty of the scene—the village of Kastraki, the monastery of Saint Nicholas Anapausas, the Meteora rocks. I then close my eyes to the late afternoon sunshine and reflect upon my Grecian adventure. The architecture and art and outcroppings have in some mysterious way fashioned my being in a manner I cannot even begin to comprehend. I feel intimate parts of my personality falling away as I delve deep into the very recesses of my soul. Meteora has worked her magic upon me as I merge with all that is timeless and wise and beautiful. Withdraw into yourself and look. And if you do not find yourself beautiful yet, act as does the creator of a statue that is to be made beautiful: he cuts away here, he smoothes there, he makes this line lighter, this other purer, until a lovely face has grown upon his work. So do you also: cut away all that is excessive, straighten all that is crooked, bring light to all that is overcast, labour to make all one glow of beauty and never cease chiselling your statue, until there shall shine out on you from it the godlike splendour of virtue, until you shall see the perfect goodness surely established in the stainless shrine. When you know that you have become this perfect work, when you are self-gathered in the purity of your being, nothing now remaining that can shatter that inner unity, nothing from without clinging to the authentic man, when you find yourself wholly true to your essential nature, wholly that only veritable Light which is not measured by space, not narrowed to any circumscribed form nor again diffused as a thing void of term, but ever unmeasurable as something greater than all measure and more than all quantity—when you perceive that you have grown to this, you are now become very vision: now call up all your confidence, strike forward yet a step, you need a guide no longer, strain, and see. This is the only eye that sees the mighty Beauty. If the eye that adventures the vision be dimmed by vice, impure, or weak, and unable in its cowardly blenching to see the uttermost brightness, then it sees nothing even though another point to what lies plain to sight before it. To any vision must be brought an eye adapted to what is to be seen, and having some likeness to it. Never did eye see the sun unless it had first become sunlike, and never can the soul have vision of the First Beauty unless itself be beautiful. Therefore, first let each become godlike and each beautiful who cares to see God and Beauty. So, mounting, the Soul will come first to the Intellectual-Principle and survey all the beautiful Ideas in the Supreme and will avow that this is Beauty, that the Ideas are Beauty. For by their efficacy comes all Beauty else, but the offspring and essence of the Intellectual-Being. What is beyond the Intellectual-Principle we affirm to be the nature of Good radiating Beauty before it. So that, treating the Intellectual-Kosmos as one, the first is the Beautiful: if we make distinction there, the Realm of Ideas constitutes the Beauty of the Intellectual Sphere; and The Good, which lies beyond, is the Fountain at once and Principle of Beauty: the Primal Good and the Primal Beauty have the one dwelling-place and, thus, always, Beauty’s seat is There.